It’s no secret that I tend to be a fan of the small brands. The brands that start out with a wish to do something different, pulling inspiration from somewhere outside the mainstream, and maybe without a primary goal of becoming a global brand. Just for the sake of doing something cool. There are a number of brands like this around, and especially in the UK now there is a manufacturing industry with the capacity to cater for the smaller brands. Think SEH Kelly, HebTroCo, Jago, Paladrin etc. Today though, I’m talking about Bristol-based one-man-brand Work & War. With a vision and creative drive. 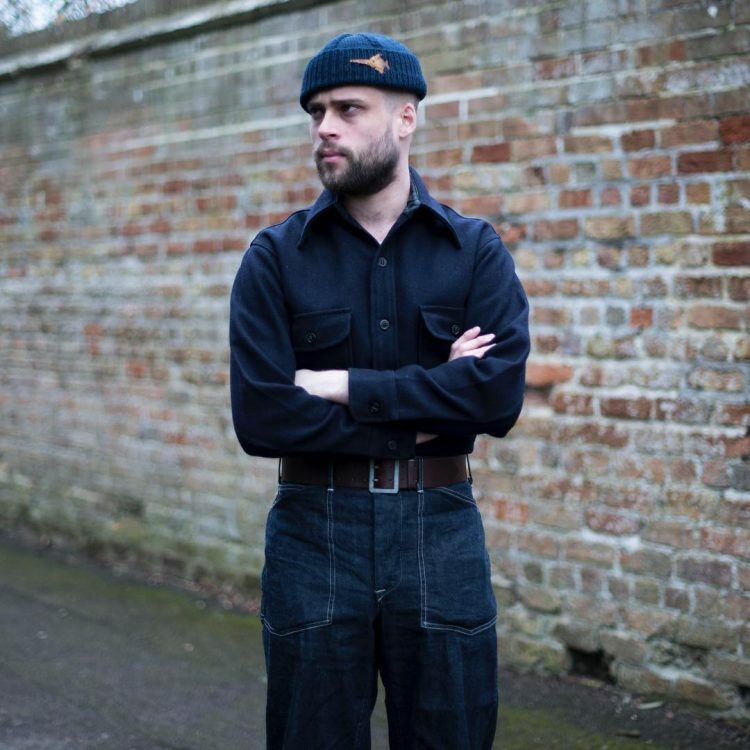 Work & War from Bristol ticks all the boxes, being a one-man company with a strong determination to recreate and update some of the most ruggedly functional garments from an era where functional army garments were first developed.Work & War is the brainchild of Joe Ruddock, by daytime an art director working in advertising, by evening an enthusiast and collector of rugged 30’s and 40’s style clothing, and moody master of the black and white seaside photos. The first mini-collection from W&W consisted of a jacket, a shirt and a knitted hat. An odd selection, maybe, with the jacket as the obvious centrepiece and the shirt and knitted hat as interesting collaborations with other makers. While the latter two sold out almost immediately, let’s take a look at what Joe came up with in his first collection. 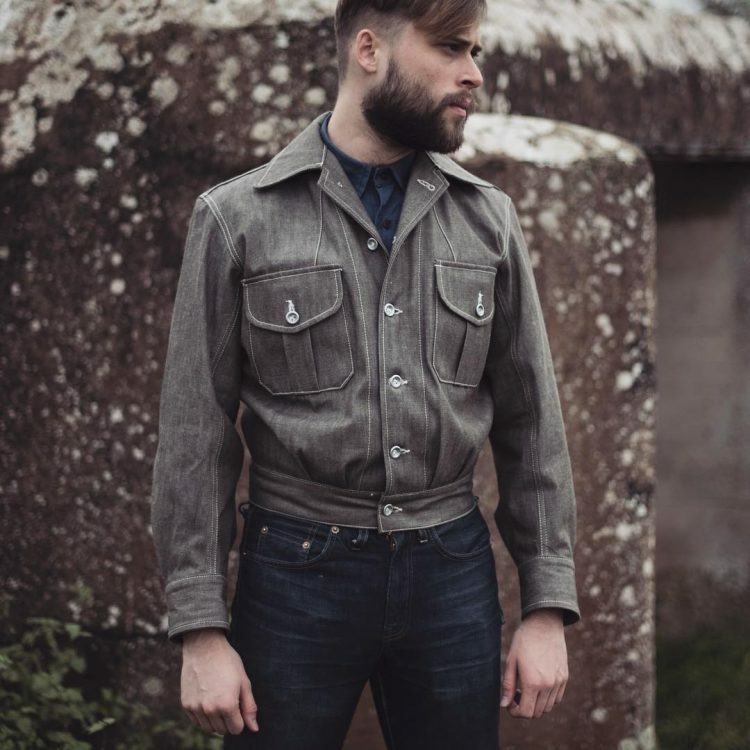 The jacket is based on a uniform jacket worn by German U-boat crew, which was again based on a British denim jacket captured at Dunkirk in 1940. A convoluted-sounding history, but to me, it brings to mind the classic WW2 battle blouse. 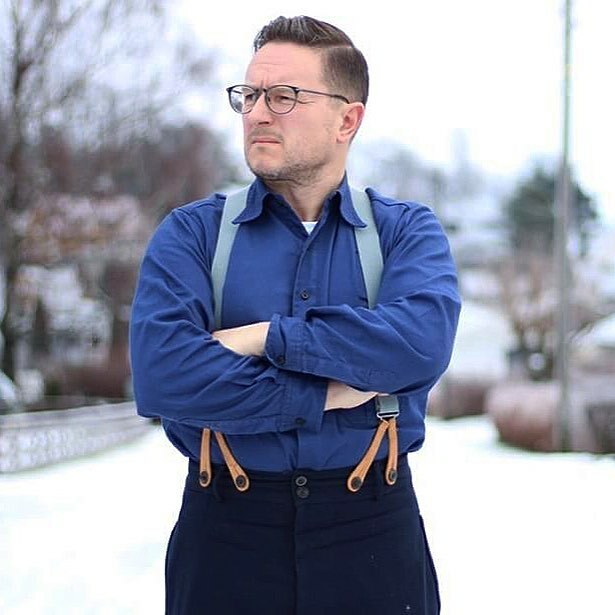 The original was worn with very high rise trousers and is characterised by the huge pleated chest pockets and roomy arms. A really great look, but not all that common these days, so this jacket makes a welcome appearance. The body has been extended so it works with trousers of a more modern waist height. 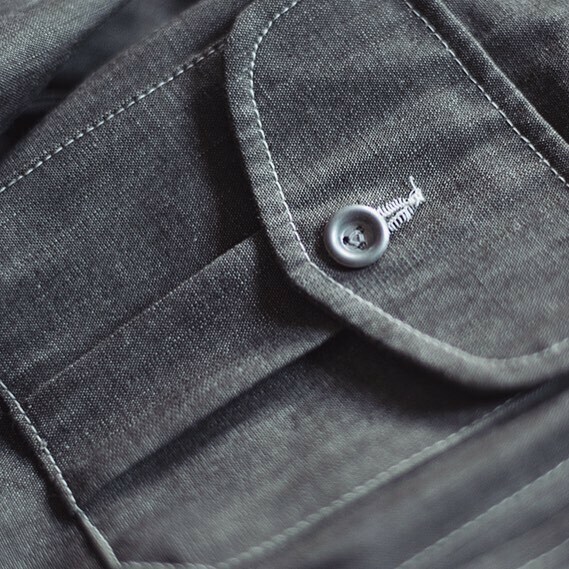 Joe is totally dedicated to dedicated to the details, so managed to find a deadstock 11oz Japanese Chambray fabric to use, and had special 3-holed aluminium buttons made up. And then had the jacket made in a factory in Britain. With the crew jacket underway, Joe came across Kurtz Clothiers in Australia. Now Kurtz is a similarly tiny company. To be precise, it’s really just Pete. 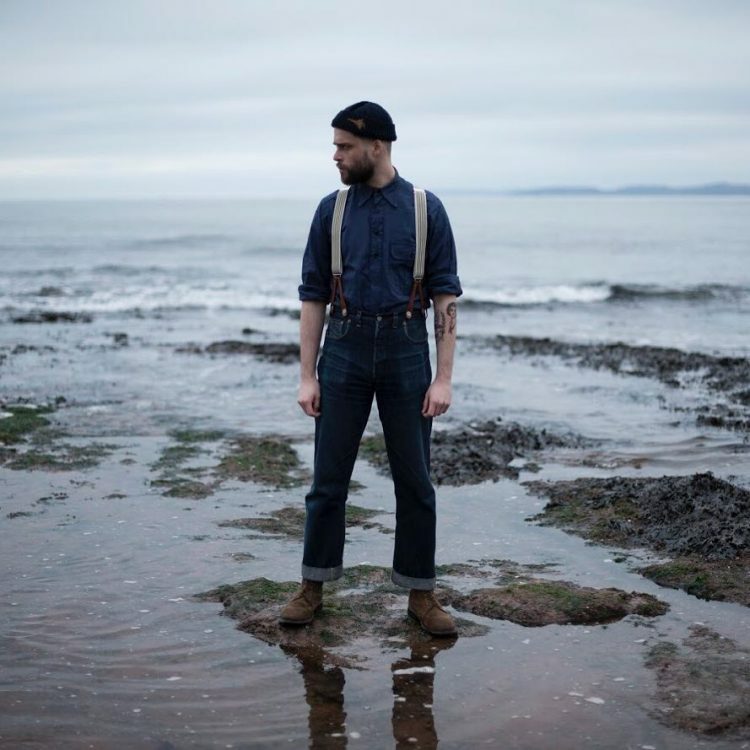 He specialised in making handmade vintage style garments, primarily shirts. For this collaboration, they wanted the pre-war European vintage look and settled on a 1930’s version. With a seldom seen spearpoint back collar, pleated pocket and tunic front. 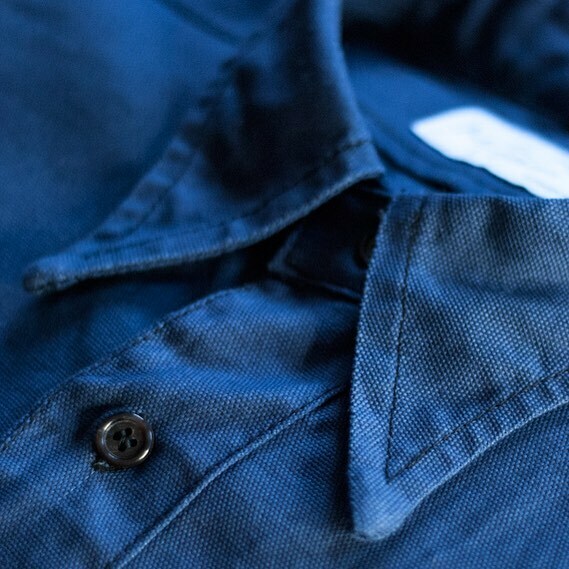 The fabric is an 8.5oz blue cotton duck and the buttons are deadstock British horn. The duck fabric is not a typical shirt fabric and does require wearing and washing to soften up. Then again, it’s made to last, so there is plenty of opportunity for that to happen. The final collaboration was another meeting of minds, between Joe and the vintage-style knitter, Hen Johnson, known to fans as Miss Pitchy Patchy. The Skull Caps were a definite war-time feature, often worn under helmets to keep their head warm and the helmet more comfortable. Miss Patchy hand knitted them, one at a time, using period knitting patterns and 100% Aran wool. In person, they are knitted from nice, thick wool in a ruggedly solid pattern. As was the style of the time, they sit more on the head than down over the wearer’s ears, so it’s more of a look than something I’d use as winter wear (read about my issues with woolly hats here). It’s a splendid looking hat though, with very much more character than the usual finely woven beanie style. And of course, there is the badge to give it the final touch. 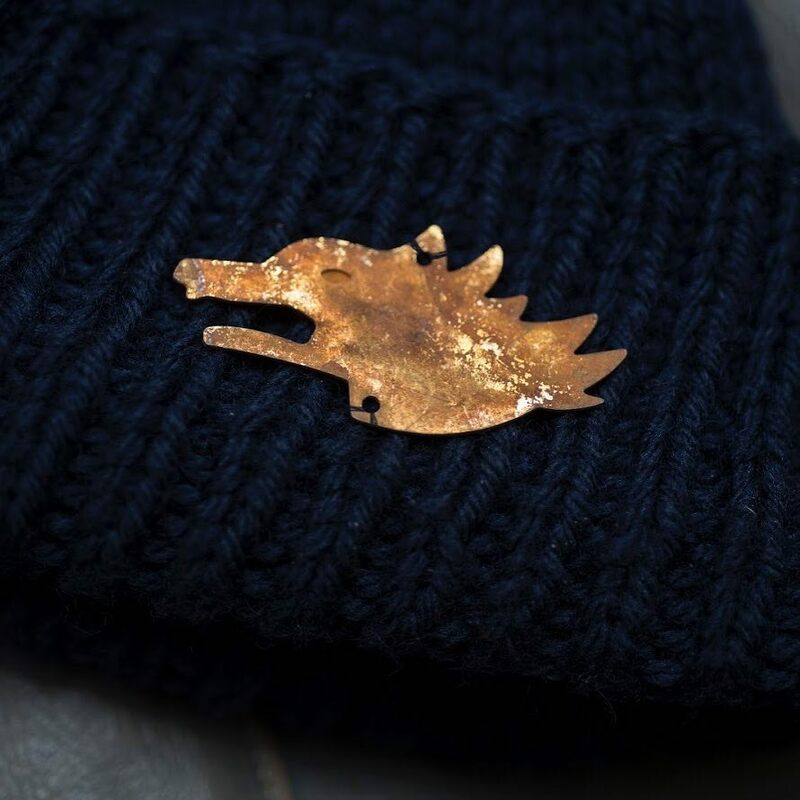 The badge is inspired by a German U-Boat wolfpack badge, hand cut in metal and aged. By the time you read this, I imagine the initial offerings will be long sold out (apparently not, there is a shirt and a few jackets left) and Joe will be working on new projects (he hints about them on his Instagram). Find more about Joe and Work & War on his website here. What colour would you say these jackets are, Nick? Their website describes them as being tobacco brown or a more lighter olive colour, but they look very grey to me. Presumably the Germans eventually made their own versions of the British denim blouse, possibly in field grey (another colour that likes to play tricks with the screen, appearing more grey than green!) I think these look good though, and I like the fact that they don’t have the waist belt to flap about if worn open. Hi Jonathan, there are two colours, both of which have a base greyish greenish colour (yes, not that easy to explain). The tobacco brown adds brownish colour to is, the green looks to have more of a green tone. Mine is the tobacco colour one and I really have to stop to consider it to say it’s really all that brown. Makes a nice change from having a lot of green jackets. it’s a nice looking jacket though, I’ve always thought the battle blouse look was ripe for a modern take!